With or without chicken, now that is the question? I would like to take a moment to be honest about meal planning. Sara and I do love a good week of planned out meals and maybe that is something that you would love to see, but our lifestyle is not conducive to full planned out meals. With both of us being married to firefighters, we are often on our own with the kids for dinner a few times a week. This Couscous Salad is the exact type of last minute meal planning that I like to have on hand. Simple and savory, chicken can be added last minute should Shane be home. 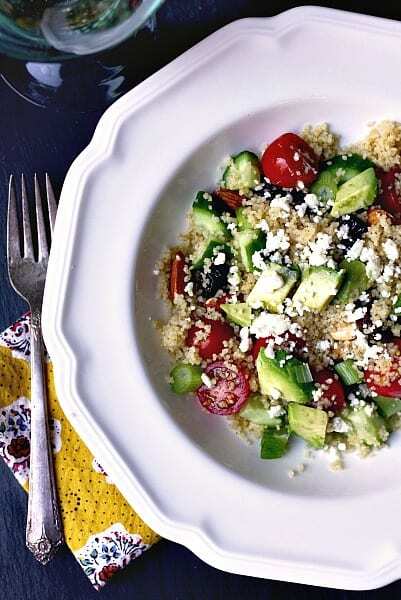 This Couscous Salad also makes for the perfect Meatless Monday. Oh, another thing I should mention is that yes, I am a carb junkie. What I love about this meal is that it can be loaded with as many vegetables as you like making the couscous a small portion of this meal. Sometimes I add spinach or arugula to the mix. 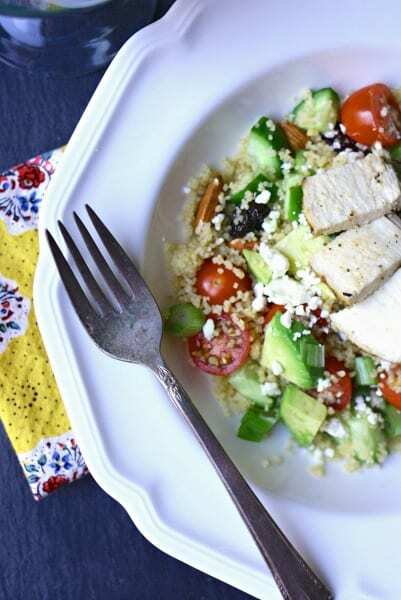 The couscous is whole wheat, making this dish healthy and filling. Using a large sauce pan add one cup of chicken broth and the butter. While you are waiting for the broth to boil, clean and slice all the above veggies. Once the broth is boiling, turn the heat off. Add the couscous and mix with a fork. Add a couple dashes of red pepper flakes and salt to the couscous. Cover with the pan lid and let sit for 10 minutes. *If you are deciding to add chicken, we marinated our chicken in lemon juice, 2 tablespoons of olive oil and 2 cloves of garlic. The chicken was then placed on the BBQ for 5-7 minutes until done. Once the couscous has sat for 10 minutes, take off the lid. Fluff again with a fork. Place the couscous in a large bowl. 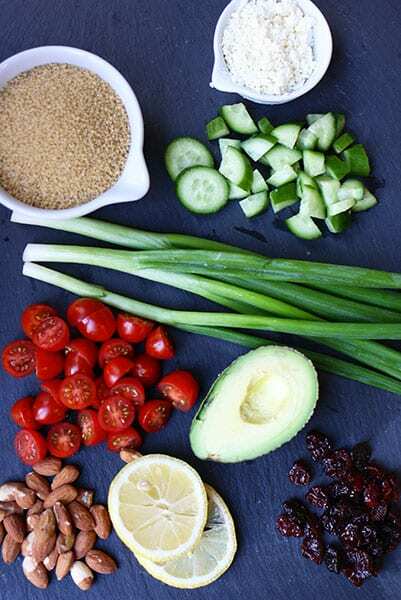 Add all the veggies but the avocado. Add the cherries, almonds, and cheese. Lightly mix with a fork. Thanks Amanda, we hope you try it. It really is that simple and perfect for spring.